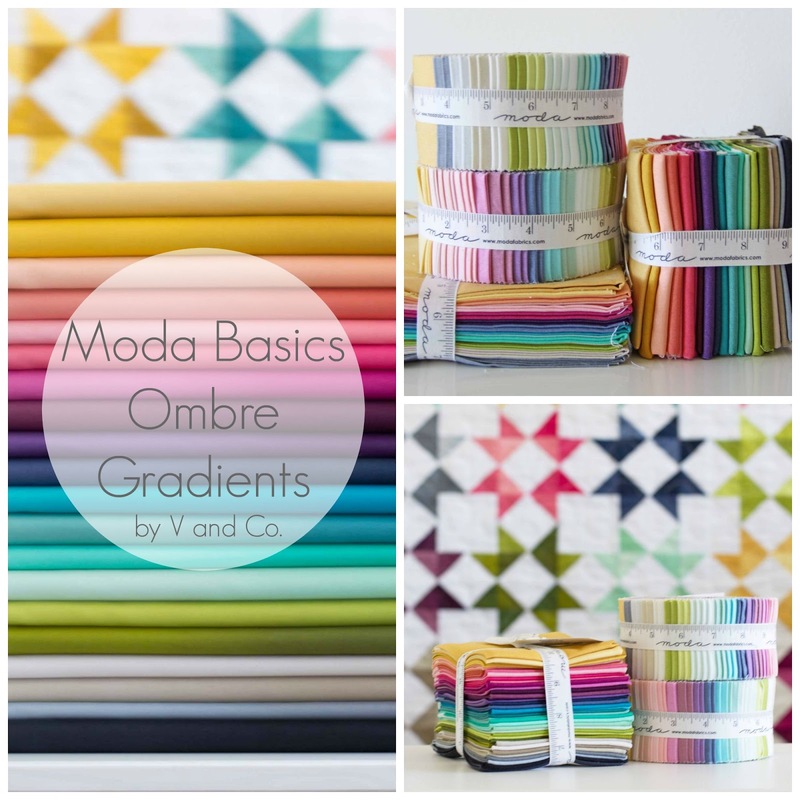 The day has come where I talk and talk about our newest patterns using all TWENTY of our new Ombre Basics with Moda. I really can't gush over these enough, I've been dreaming of these for 5 years. And I feel like I just want to scream from the hilltops about them! It's been so fun working with them in real life, and I have a feeling you will enjoy them too! 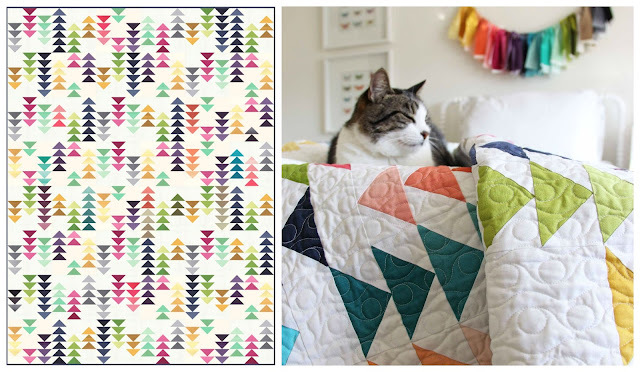 So lets start talking about our newest patterns shall we? 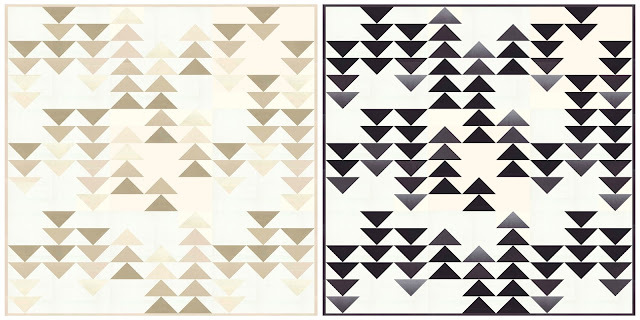 This pattern highlights the use of each of all the different shades in each of the 20 colors we offer. 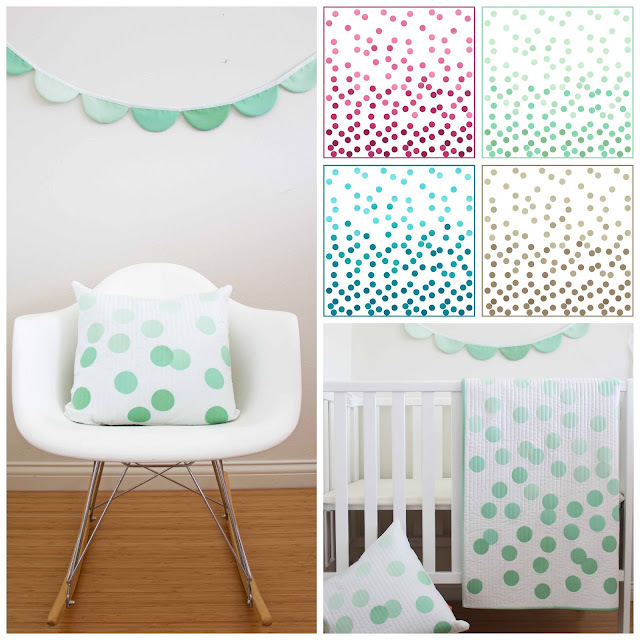 These circles are appliquéd, and we show you how to turn over appliqué in a quick and painless way using your sewing machine. Of course there's always the even quicker way of appliqué, with raw edges! Have a GO cutter? 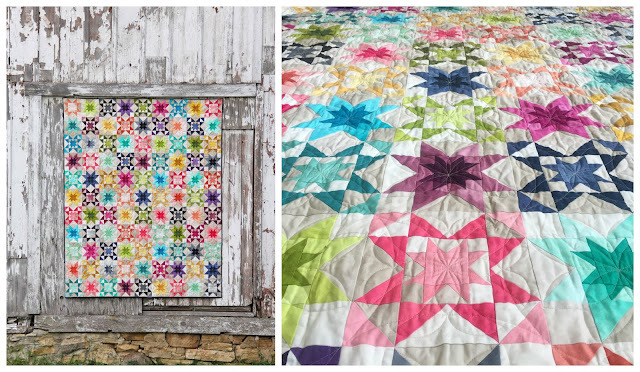 well then, use the 2" circle template and you will have yourself a quilt in a couple of hours! 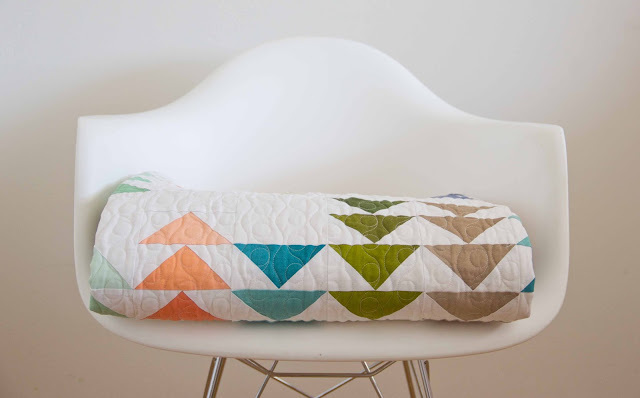 This pattern also includes instructions for the pillow and the banner shown. Up next is Criss Cross Applesauce. This Pattern uses every one of the 20 Ombre fabrics (minus taupe). Pay close attention the background, that my friend is using just one ombre gradient called Sand. I wanted a neutral that could be used as a background all on its own and that color is Sand! Taupe would be another great one to use here as well, but we wanted to really show off this neutral with its different shades! 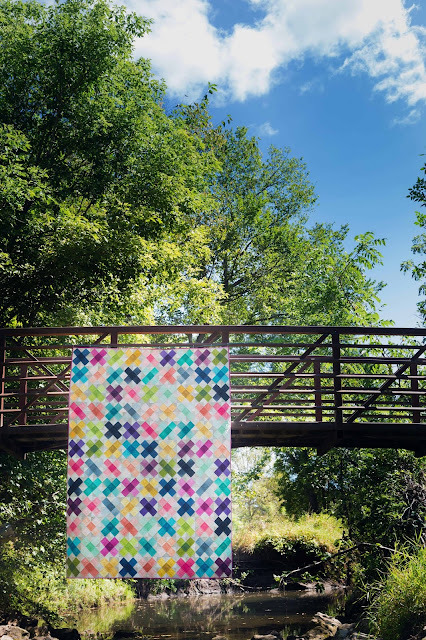 I can't wait to use it in like every quilt! 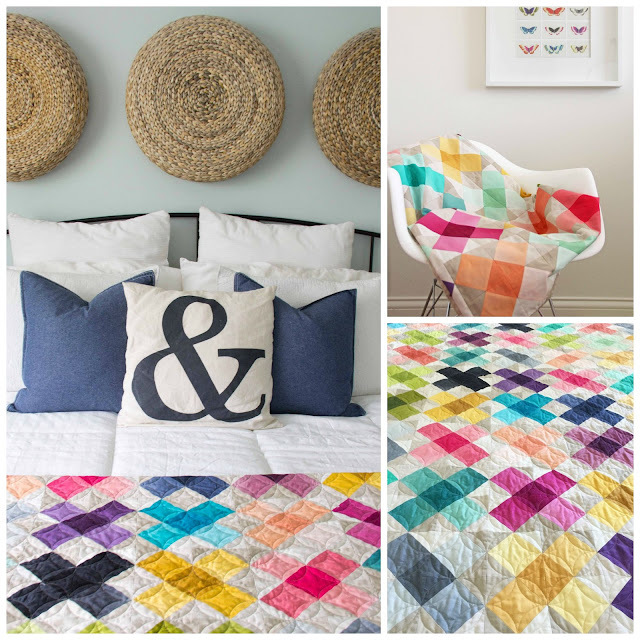 I know I say this every time, but I mean it this time…THIS quilt is my favorite. 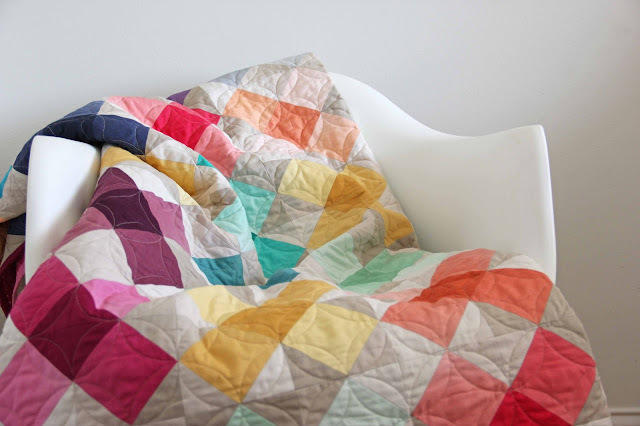 I may or may not have already placed this quilt on my bed, even though it needs to go to market. Whatever LOVE IT! Photographer Lauren (who also did all my Simply Color book pictures) came down for a night and we had some fun. She was on assignment from something else and well when she was done she did me a huge favor. We, (by "we", I mean her…) she went into the creek (with snapping little fish) to get this picture. 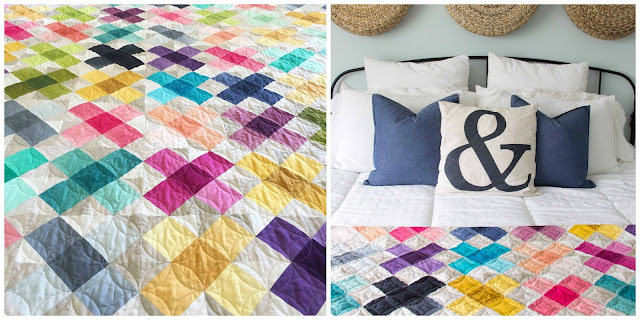 this picture shows the quilt off beautifully! Thanks Lauren!!! 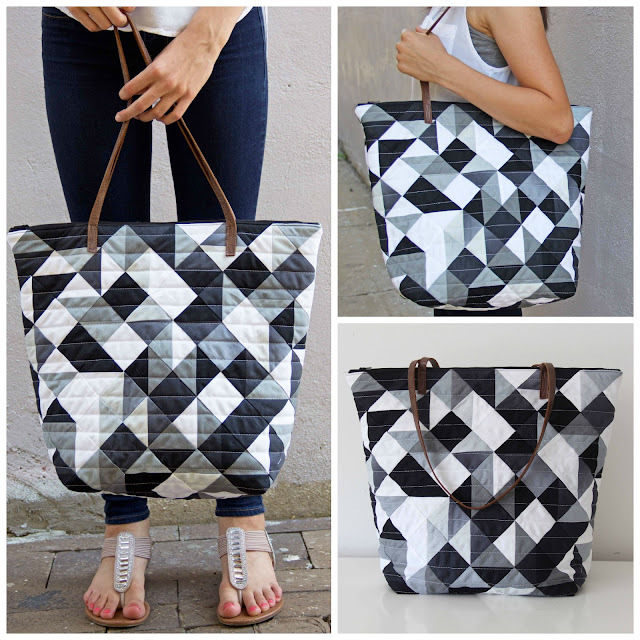 This quilted tote consists of 2 ombre colors (here it's graphite gray, and onyx) with white, made up of half square triangles, and squares to make a stunning look for this bag. 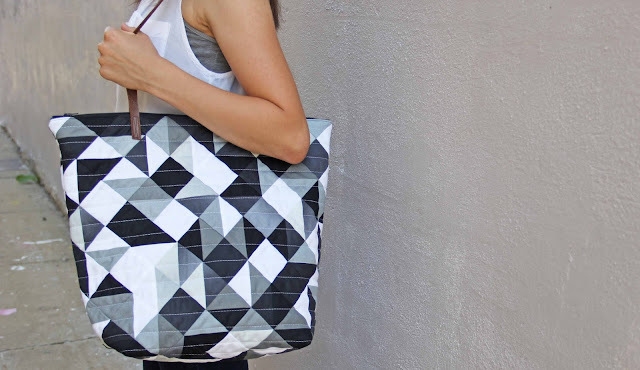 Large enough to store quite a bit, but not too big that you couldn't use it as your regular around the town bag! The leather handles makes for a nice polished look. 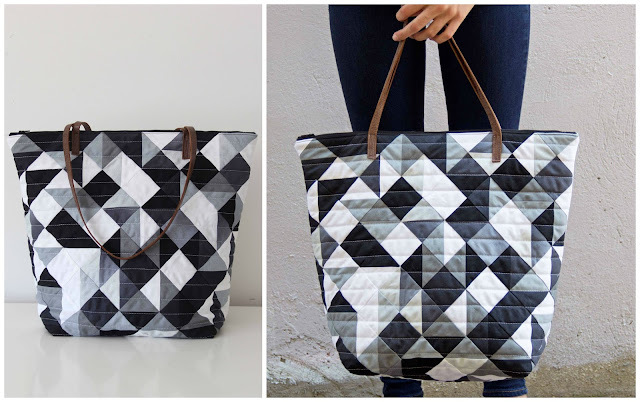 This bag measures 18" x 15" x 6"
This quilt is pretty awesome if I do say so myself. The Judgy Cat herself really likes this one too. It's her favorite, its the one she planted herself on every time it was anywhere. 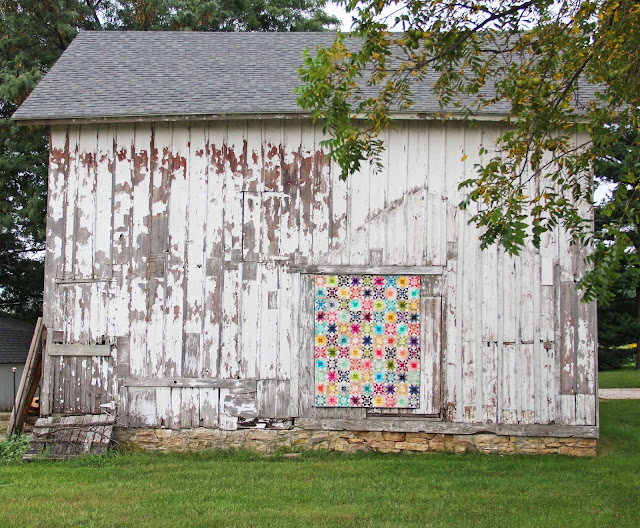 She didn't touch the other quilts just this one. I'm kind of offended that she isn't too into the other ones, almost enough to ask...Like she'd tell me anyways. 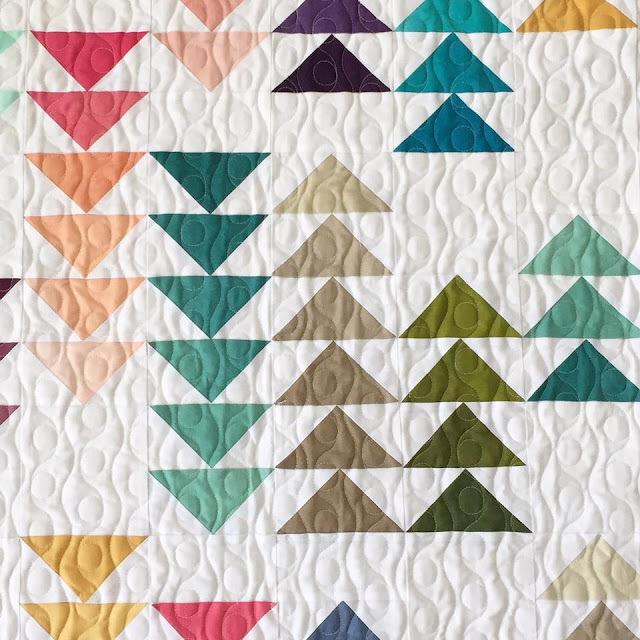 so even though we didn't use Onyx and Sand in this one…look how beautiful it would look as a baby quilt in these neutrals! Here on the left (the close up) you see popsicle pink, coral, honey, the lightest shade of persimmon, lagoon, popsicle pink again, aubergine, taupe, and a little bit of navy. 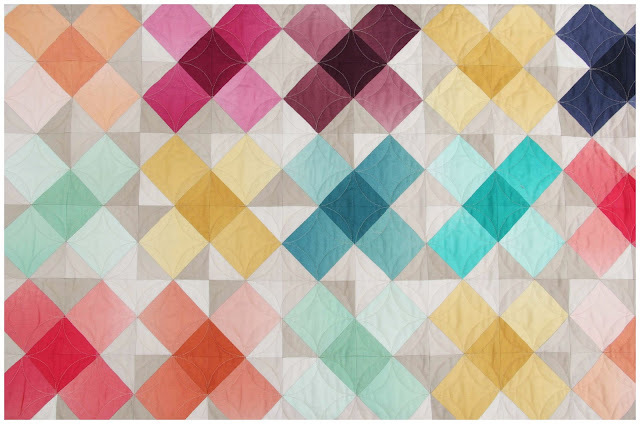 This is another quilt pattern that uses most of the ombre colors. Notice the background? Yep! Sand does it again! 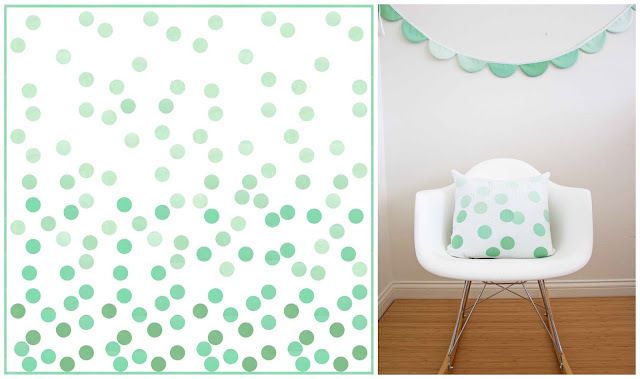 Just enough variation to make it AWESOME background fabric! You're welcome (ha!) 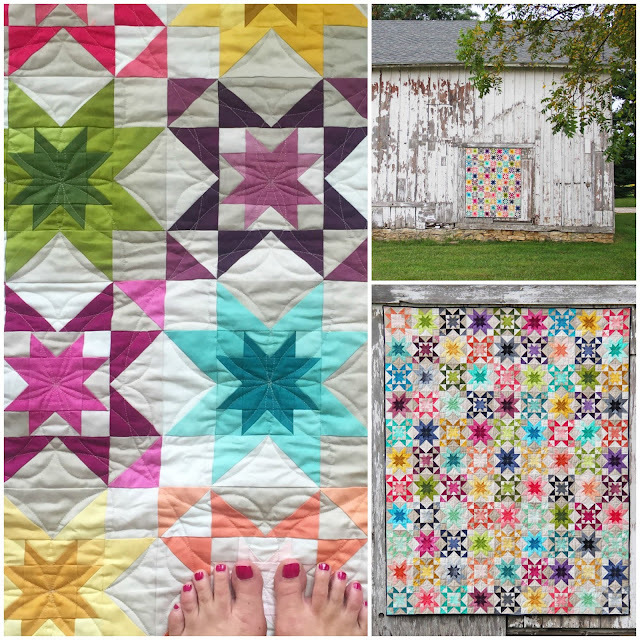 This quilt pattern highlights my favorite star. The sawtooth star. 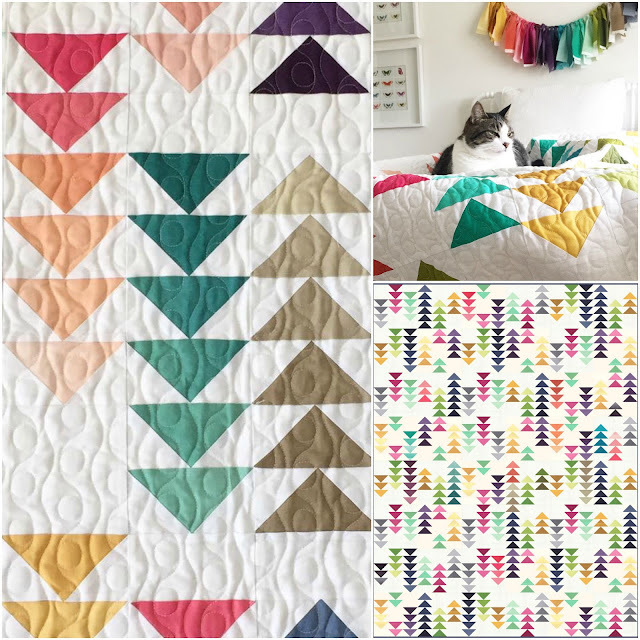 It's really a gorgeous quilt, and the ombre fabric makes it look like you are using so many more fabrics than what you really are! 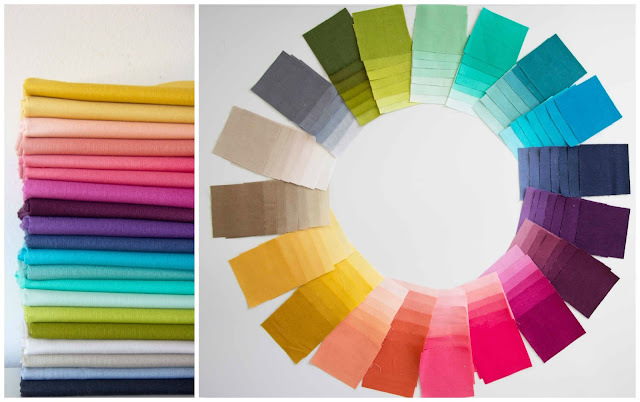 This is one of my favorite things about the ombre fabric, that and that it looks almost hand dyed when you piece with it traditionally. 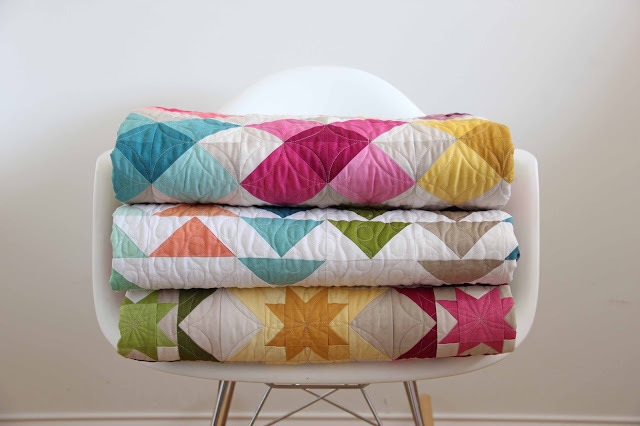 Huge shout out to the ladies that helped me piece these quilts, Sarah and Donna, who don't have blogs but who help me so much in getting everything done in a timely fashion. You ladies are the best and I appreciate you immensely!! CONGRATS can't wait to see what you make with these!!!! Ombre's are available for purchase if you are a quilt store owner through your MODA REP now, and will ship to stores January 2016. And if you aren't a quilt store owner? well ask your Local Quilt Store to stock up!!! 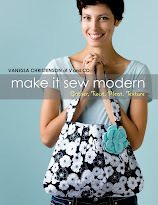 Cause we are going to keep giving you more patterns as the months go by! 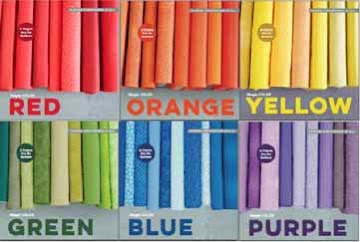 Alrighty friends, go and purchase your discounted patterns (for a limited time) by adding OMBRE30B at check out. Lots of love and we'll talk soon! Sale ends September 14 at midnight.